An excellent thriller The French Connection which deserves the praise it gets. It was followed by a sequel (French Connection II) equally as good. Roy Scheider, even though he didn't appear in the sequel, did star in a similar kind of film, The Seven-Ups which had a car chase as good as the one in The French Connection. Interesting story, top cast, well filmed and full of standout scenes (and not just the famous car chase). I haven't seen the sequel yet, and I've heard good things about SEVEN-UP (if the car chase is as exciting as the one in this film, I'll definitely have to make it a point to check it out). I agree with everything you've said about this movie. Thanks for the comment, and for checking out the blog. 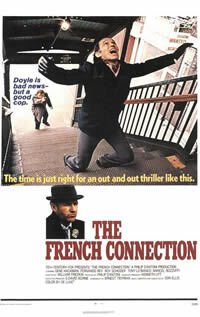 Excellent thriller with a terrific performance from Hackman. Compulsive from beginning to end. Fast moving and energetically directed.